Signed UK first edition. Signed and dated by the author. Synopsis : 'She was always in many places at once, invested deeply in a hundred different notions, and of all the things I liked about Saskia that was the thing I liked most'. One snowy morning in an old European capital, a man wakes in a hotel room. A young local woman he has befriended calls to the hotel, and the two of them head out into the snow to find the man an apartment to rent. 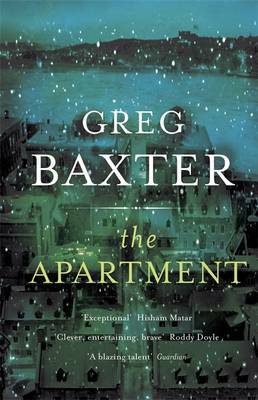 Greg Baxter's astonishing first novel tells the story of these two people on this day - and the old stories that brought them to where they are. Its magically subtle and intense narrative takes them across the frozen city and into the past that the man is hoping to escape, and leaves them at the doorstep of an uncertain future. "The Apartment" is a book about war, the relationship between America and the rest of the world, and the brittle foundations of Western culture; but above all it is a book about the mysteries and alchemies of friendship - truthful, moving and brilliant.